What could be cozier on a blustery winter's day than a mug of tea by the fire with freshly baked Irish soda bread slathered with sweet butter and tangy orange marmalade? Or more invigorating on a crisp, cool afternoon in autumn than a picnic in the country with sharp English cheeses; crusty white peasant bread; vegetable, cheese, and apple tarts; and Thermoses of steaming warm tea? Or a better way to celebrate the ripe berries of summer than a dessert party tea in the garden with lemon-curd tartlets, raspberry shortcake, raspberry sorbet, sugar cookies, and tea served in flowered china cups? A cookbook and style book, Having Tea includes a range of stunning locations with recipes, menus, table settings, and serving ideas for tea. There are formal and elegant teas that ring in the winter holidays with rich dark fruitcake, shortbread, brandy snaps, and sherried English trifle; a tea for one in the study with spicy ginger Bundt cake and a plate of cookies; and tea for two in a loft, with slow-scrambled eggs, cornmeal muffins and apple butter, and panfried tomatoes sprinkled with fresh tarragon. Each menu provides suggestions for the ideal tea to suit the meal. Since the American style of tea drinking originated in England, Having Tea goes to the source to show two classic English tea rooms, tea at the Savoy Hotel in London, and a tea dance at London's Waldorf. In addition, there are special sections on the history and different varieties of teas, selections of teapots and tea services, and directions for brewing the perfect pot of tea. A final section, the "Tea Larder," offers ideas for tea trimmings from honey to mint or ginger, tea sandwiches, and a directory of mail-order sources for tea. I have been collecting books on afternoon tea for the last twenty years. This outstanding book, against which I judge all others, is a must have for anyone interested in afternoon tea. I have made almost all of the recipes many times and several items, particularly the Victorian poppyseed cake, can be found waiting in my kitchen for guests any day of the week. Every recipe has consistantly turned out delicious and beautiful. The text is invites repeated reading by its gently lyric style and the photographs are at once dreamy and alluring. You will return to this book time and again. The photos in this book are lovely, and some of the theme ideas are nice, but honestly, the recipes didn't do much for me, for the most part. 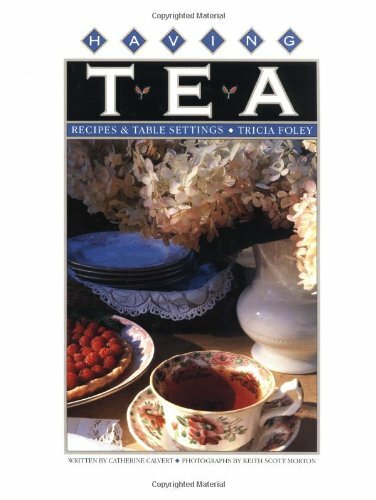 If you want some inspiration, and you want some photos for ideas on creating ambience for a nice tea party, then this is a good book; if you're looking for a cookbook, best keep looking. Sure, the photos are pretty but are the recipes any good? I tried the raisin scone recipe - it was very dry and the salt needs to be reduced by at least half if not three quarters. I wonder if any recipe testing was done before this book went to print. The photos in this book transport the reader to settings of fantastic themed teas, such as a picnic, a Christmas celebration, a hotel tea dance, or a scholar's study. The lush photography and the care that was taken to provide appropriate illustrations to accompany the recipes is worth the price of the book alone. But wait -- there are some darn good recipes here too. I love the honey mustard chicken -- it comes out moist, even using lean white meat. The Irish soda bread is hardy and irrestistably savory with the addition of caraway seeds. And the corn muffins are perfect for a cold winter's breakfast. There is some valuable information about tea, its preparation, and the accoutrements of the tea ceremony, although the emphasis is on the western tea ceremony, as opposed to the eastern version. This book was the first I bought about tea, and it inspired a rather large collection of tea books. Please see the list I created at my Amazon home page for my recommendations on other great tea books. This book is a valuable gift from the authors to all fans of tea. Absolutely wonderful recipes for the learning-to-cook cook ...Every soup I have prepared from this book has been deliciously satsifying in aroma, texture & flavor. Our family now enjoys a soup made from these recipes each night as a regular part of our dinner. We are up to 3 new soups per week! And I am becoming renowned for my soups - who would've thought? But I do share my secret...this cookbook is too good to keep to myself! 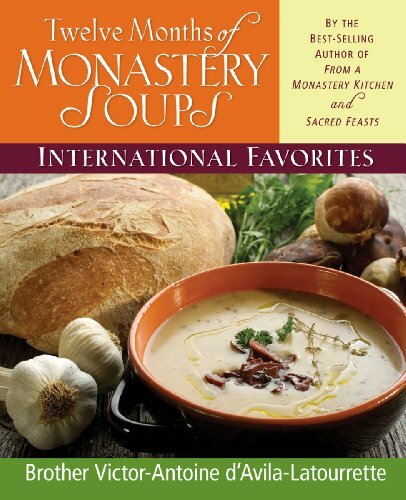 Twelve Months of Monastery Soups is an excellent, seasonally based cookbook for practical soup making. However, you must take its estimation of servings as dubious - his "two servings" is eight servings as a meal in my house. Three things separate this volume from other soup cookbooks: (1) the soups are arranged by month that the ingrediants would be readily available in your garden or green grocer's. (2) the recipes are international but are the cooking "of the people" not of exotic chefs (3) delightful line drawings, quotations, odds bits of trivia etc. are sprinkled throughout the pages. To give you a flavor of the variety of recipes presented: for March we find a German Saint Lioba Beer and Mushroom Soup, a Spicy (East) Indian Soup, a Basic Onion Soup, a Tuscan Green Vegetable Minestrone, an Everyday Potato Soup, a Garlic Soup, a Lima Bean Soup, a Beguine Cream Soup, a Saint Patrick Irish Cheddar Soup ... All the recipes are easily made; they have clear instructions and ingrediate lists. Best soup I've ever made. I received Twelve Months of Monastery Soups as a gift for Christmas and I love it. Most of the soups have been a big hit for everyone in my family. I highly recommend this book. The recipes are easy with usually only two or three steps for each soup. I have found a couple of soups that I didn't like in here, but the overwhelming majority of them have been excellent. I especially love the Cream of Broccoli and Cream of Asparagus as well as the Potage du Jardin and Spinach Soup. I think I'm going to buy this book as a gift for several of my friends and family, since I think it was a great gift choice for me. Nothing warms the spirit like a bowl of soup and this book is a special joy -- filled with simple and delicious recipes for the ultimate comfort food. The recipes are organized by the months of the year to emphasize seasonal preferences and produce availability. Turn to January for great hot soups and stews in the cold months, look for lighter choices and some wonderful cold soups in the summer chapters. There are 175 (!) soup recipes in this book, all simple enough to prepare every day for your family and many elegant (yet still easy to prepare) for entertaining. The Vegetable stock in this cook book is the best and most flavorful I've ever tried and I freeze tons of it in four-cup ziplock freezer bags to use in vegetarian dishes. The recipes are meant to be experimented with and the author gives great advice for substitutions and seasoning in the preface. Because of the special emphasis on seasonal availability of produce this cook book is the perfect choice for the kitchen gardener. When Mai Pham--chef and owner of the renowned Lemon Grass Restaurant in Sacramento, California--left her home and her grandmother in Saigon in 1975, just days before the city fell to communist rule, she never thought she'd see either again. Happily for her, she returned 20 years later to rediscover her roots and reconnect with her 100-year-old grandmother. Happily for us, she's written Pleasures of the Vietnamese Table, in which she shares that journey--and the vibrant cuisine of her homeland. She weaves a stirring tale of rediscovery; of visiting with cooks in market stalls and street caf&eacute;s and home kitchens; and, perhaps most importantly, of rediscovering her "favorite food on earth," pho, the noodle soup often referred to as the national dish of Vietnam. Pham begins with a chapter on dipping sauces, condiments, and herbs, which, she explains, are the true backbone of Vietnamese cooking. She explores culinary variations: the "rice bowl" of the southern peninsula and the French- and Indian-inspired foods of Saigon; the more robust style of the cooler central region of Hue; and the straightforward style of the mountainous north. And she shares the simple, classic recipes that define Vietnamese food. Green Mango Salad with Grilled Beef is at once salty (from the ubiquitous fish sauce), sweet from the fruit, and tangy and spicy from Chili-Lime Sauce. Ginger Chicken is bright with the flavor of ginger and spicy with dried chilies; caramel sauce adds body and an intriguing sweet and smoky element to the dish. And of course, one can't forget the beloved pho, which gets a whole chapter to itself. The traditional Hanoi-style Vietnamese "Pho" Rice Noodle Soup with Beef is fragrant with anise and ginger and thick with velvety noodles and delectably rare beef suspended in the hot broth. This book is really great if you like truly authentic Vietnamese. I am Vietnamese and I really liked the cookbook. I found the recipes to be more authentic than her first book. Keep in mind that you have to have access to a Asian market in order to make some of the dishes, but what else would you expect? Her recipes call for common Vietnamese ingredients that may not be common in American kitchens. To make authentic Vietnamese food, you need Vietnamese ingredients. Most major cities will have some kind of Asian market. Some of the recipes are time consuming but this is how it is done in Vietnam, women spent their entire day cooking. If you are trying to cook authentic Vietnamese, this is one of the best books to own. If you want an Americanize book, this may not be the one for you. The most authentic Vietnamese cookbook available today. I'm Vietnamese, and I've been looking for an authentic Vietnamese cookbook for a long time. "Pleasures of the Vietnamese Table" contains deliciously authentic recipes that could be duplicated at home. This book also has lots of great background information regarding each recipe. 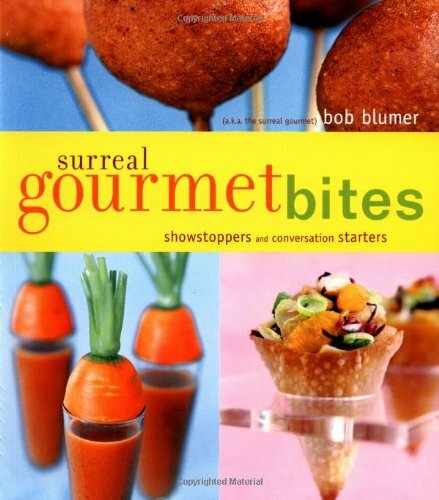 Other people complain that this book has no pictures of the food, but I really don't need the pictures because I've grown up eating the same food, so I know what they should look like. If you need pictures of the food, then I suggest Nicole Routhier's "The Foods of Vietnam", which has beautiful pictures of the foods. I find that Nicole Routhier's recipes are just a little bit more elaborate than Mai Pham's recipes, so I prefer to cook using Mai Pham's book. If you know Vietnamese food well enough, you could leave some ingredients out of Nicole Routhier's recipes, and they will still taste delicious. For example, Nicole Routhier uses milk to make fresh coconut milk, but Mai Pham uses water instead. I think using water to make coconut milk is simpler and also more authentic. 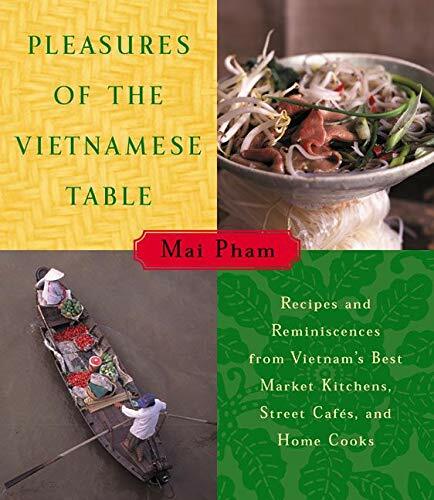 I recommend Mai Pham's "Pleasures of the Vietnamese Table" for anyone interested in cooking authentic Vietnamese food. I also recommend Nicole Routhier's "The Foods of Vietnam" for its beautiful photographs of the food and also for many of its recipes. You can't go wrong buying these two books, and I do think you need both books in order to have a complete understanding of Vietnamese cuisine. I was skeptical when I saw this book but after reading the recipes and trying many of them, I can say that, as a Vietnamese person, the recipes are truly authentic. They're what you would expect to eat if you spent time in Vietnam. Also, the sections that give historical and culinary background information are great! If you only had one Vietnamese cookbook, this would be the one. What more can you ask for? The author went back to Vietnam and collected recipes from the best street-food vendors and home cooks, and she compiled them into this gem of a book. The recipes are authentic and delicious! No fancy restaurant dishes are included here. The techniques and recipes are easy to follow. This is hands down the best Vietnamese cookbook. Regular Vietnamese folks such as myself could actually cook from this book on a daily basis. I bought 4 copies and gave them as gifts. Rich and silky, fresh foie gras is one of the world's great foods. But until the mid-80s, due to importation restrictions and without domestic production, none was available here. 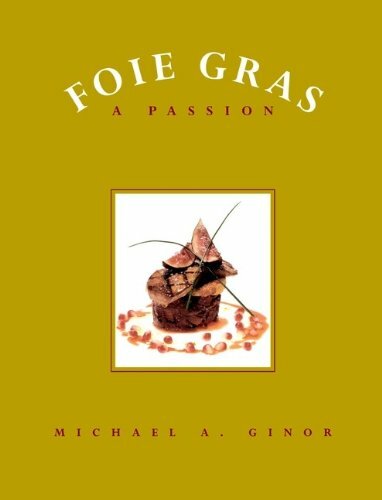 Michael A. Ginor, proprietor of Hudson Valley Foie Gras, was among the first to establish production of domestic duck foie gras, which excited the livers' current popularity.Foie Gras: A Passion, by Ginor and Mitchell Davis, celebrates foie gras in words and pictures; though it contains 80 chef-created foie gras recipes, accompanied by alluring color photos, the book is best appreciated for its thorough exploration of its subject. Those interested in this extraordinary specialty, and its place in modern American cooking, will embrace the book. Great book about an excellent ingredient! Foie Gras is a scapegoat for animal welfare types, and they're welcome to their say. Yes, foie gras is hepatic lipidosis... But that's what makes it so good! It's like well-marbled beef.. the extra fat in the liver makes the flavor exquisite. I've even had the opportunity to serve it to one of my animal welfare friends without their knowledge (yes, a bit on the dark side, I know), and they were absolutely thrilled with the taste. The top restaurants in the world will have foie gras as part of their menu. Perhaps some day biotechnologists will be able to grow it from liver cells so the animal welfare folks can move on to another cause... but for now, if you don't mind the controversy, get this book, learn all about Foie Gras as a gourmet ingredient, and boost your cooking expertise! Look, if the Iron Chefs use it, it's got to be good stuff! Remember, life is too short to eat low-quality food, and taste is everything! This book is truly a one volume reference on the subject of foie gras. Mr. Ginor devoted a lot of time into the research of this book, and it shows throughout. Extensive research went into the historical portion. How foie gras came to hold its status is explained. The social and cultural elements are covered and explained. Foie Gras is a subject of controversy, both in regard to health and in regard to "animal rights". The book covers both areas, tactfully and tastefully. His arguments in defense of foie gras are well thought out and historically justified. The recipe section of the book is beautifully done. The presentations are mouthwatering and the photography is gorgeous! The recipes cover the entire spectrum, if it can be done with foie gras, it is in here!. I found a few of the recipes to be a little far fetched, but that is only a matter of my taste, no reflection on the recipe creator, or of the author. A vast majority of them are wonderful! I am anxious to serve tham to my customers! I heartily recommend this book to anyone interested in the subject of foie gras. I feel it to be essential in the reference library of the Professional Chef! Mr. Ginor: Very Nicely Done! I can't believe that Foie Gras is still legal here! Anyone who eats it should be ashamed of themselves. It is pure callous gluttony when someone can eat a food that was obtained by literally torturing an animal. What do people think, that the duck's liver magically enlarges on it's own? If so, they would be drastically wrong. Those poor ducks are force fed through a pipe that is shoved down their throats! The workers who 'feed' the ducks get a bonus if they manage to not explode a certain number of duck's stomachs every month. I saw a video on this, and also saw a foie gras farm, which are not many because this cruel 'delicacy' is outlawed in so many places, but one farm is near where I live. It was worse than I imagine hell being. To all who eat this horror of a food: Find a tiny bit of compassion inside yourself. How would you like this to happen to your dog or cat? The poor ducks and geese which this "wonderful delicacy" comes from are force-fed to grow an abnormally and painfully large liver. This is absolute cruelty. You may think, hey, they're just animals, but you know what? So are we! How would you feel if someone decided hmm, I want to try some englarged human-liver, and picked YOU as the victim. You'd be stuck in a small cage, forcefed antibiotics to keep you barely alive while you were also forcefed other things to enlarge your liver, also known as giving you a disease. You would be suffering because of intense pain without pain relievers. You'd be miserable and would probably go crazy because of confinement. Then, of course, you would be painfully and inhumanely slaughtered. "I can almost taste a slice of heaven." Wow, if heaven is diseased liver, remind me to go to Hell. Ask any doctor. This enlarged liver is a disease. There are so many other options to choose. Please do not choose cruelty! "Foie Gras-French for fatty liver-is the grossly enlarged liver of a duck or goose. Medically known as hepatic lipidosis, foie gras is a disease marketed as a delicacy. Birds raised for this gourmet cruelty are force-fed enormous quantities of food through a long metal pipe three times a day. This process of deliberate and painful overfeeding continues for up to a month, by which time the birds' livers have swelled up to twelve times their healthy size. Has fear of hors d'oeuvres stymied your instinct for entertaining? Then give three cheers for the editors at Britain's DK Publishing, the lush, informative books they produce, and the writers that bring to press the highest level of cooking instruction and encouragement. 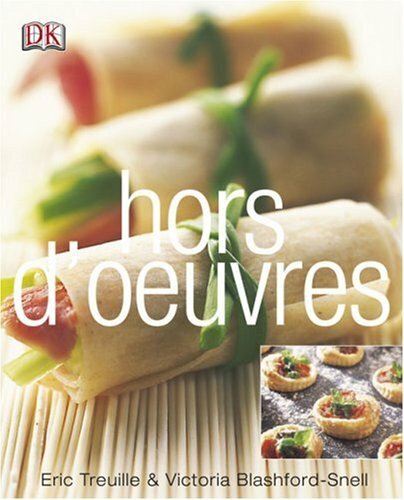 Please welcome Hors d'Oeuvres by chef and Le Cordon Bleu cooking instructor Eric Treuille and caterer Victoria Blashford-Snell. Together they will put to rest whatever hors d'oeuvres anxieties you might have, and then ignite in you a passion for preparing gorgeous little nibbles. The book is divided into sections on ingredients, equipment, recipes, techniques, and "The Party." The recipes section, in turn, is divided into chapters such as "Nibbles, Dips, and Dippers," "Tops and Bottoms," "Sticks and Skewers," "Wraps and Rolls," and "Stacks and Cases." In "Nibbles," you'll find recipes for several variations of spiced party nuts, Triple Chocolate Biscottini with Hazelnuts, Mini Gougeres, Parmesan and Anchovy Palmiers, Honey Mustard Chicken Wings, Spicy Peanut Dip, and Roasted Red Pepper, Feta, and Mint Dip. It all looks absolutely irresistible. "Tops and Bottoms" leaves your basic blini way behind. Take one Parmesan shortbread, then build on top with the likes of roasted cherry tomatoes and feta. Or how about a cocktail-size corn cake topped with spicy mango salsa? You get the idea--something below, something above, all of it bite-sized. Love to grill? "Sticks and Skewers" introduces delicious morsels like Grilled Tuna with Spicy Roasted Tomato Dip, Curried Coconut Chicken Sticks, and Mint-Marinated Lamb Kebabs with Tahini and Honey Dip. "Wraps and Rolls" includes Crab and Papaya Rice Paper Rolls with Sweet Chili Dipping Sauce, Cucumber Nori Sushi Rolls, and Crispy Wonton with Gingered Pork and a Chili Soy Dipping Sauce. "Stacks and Cases" runs along the lines of Filo Tartlets with various ingredients, Corn Cups with Tuna, Mango, and Lime Ceviche, and Quail Egg, Caviar, and Chervil Croustades. I cook for 6-24 people at a time, for casual to black tie formal occasions, and this book has beautiful and tasty recipes that have always gotten requests for "What is the recipe", or Is this easy to make? 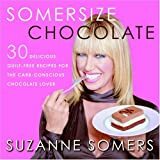 "I do not have a lot of time to prepare complex recipes, so this book's numerous offerings, with usually readily obtainable ingredients suit me just fine! My final appetizer is often slightly adapted from the book's recipes, my changes based on substituting local fresh herbs, fish for meat, or other seasonal or tropical substitutions. Recipes such as the "Filo tartlets with spicy cilantro shrimp and Thai red chili dipping sauce" are quick to make, and stand out above other more "conventional" appetizers, and can be used without the tartlets, even on toast, to keep it easy. This and other appetizers have gotten rave reviews-if you prepare this, be warned that some guests may fill up on this alone, and not have room left for the entree and dessert! Worried about not having an item...then for example, substitute sour cream for creme fraiche if it's not available for a different recipe, and it's no less tasty! There's a mix of easy creations, and some more formal ones as well in this beautiful book. The hints on preparation, and the pictures are inspirational to create numerous variations, so you get several hundred recipes from this beautiful book. I need quick, easy and tasty for my uses, and cooking from this book has provided just that. See also "The Appetizer Atlas : A World of Small Bites" by Arthur L. Meyer for more complex and varied appetizers. Buy this book, cook from it, and enjoy the smiles of your family, friends and guests! I usually cook everything from scratch and don't mind spending a few hours making several appetizers. BUT, to make just onerecipe in this book, you'd need to spend a couple of hours. The majority of the recipes are too fussy and complicated and just not worth the trouble. I made a couple of the crepe appetizers with different fillings. They were the least time-consuming but the result still wasn't worth the effort - no one took seconds. I love to eat small bites of different things, huge servings intimidate me, I feel full even before having a bite! That's why I like to serve appetizers and a main course when I entertain at home. I noticed this book on Amazon and managed to have a "look inside" so I thought it was worth it and bought it: I'm so happy I did! I have used it a number of times now and I can assure you that the recipes are wonderful and quite easy, but the results look so professional! I was really proud of myself. The first time ever was for a (very) small birthday party for my mother. Since it was an impromptu party I chose only the most simple and easy recipes, but the flavours were so rich and complex that we were completely satisfied. I used it at Easter to make an "appetizer only" and everybody was surprised and delighted (me too). I tried the Caramelised Onion Pancakes, the Potato Focaccine, several marinades for meat and seafood, the Oriental Chicken Tartlets (that were a real success), just to name a few. The Recipe section is divided into 5 sub-sections: Nibbles, Dips and Dippers - Tops and Bottoms - Sticks And Skewers - Wraps And Rolls - Stacks And Cases. Each is devoted to a single type of appetizer making it easy to find what you are looking for. The recipes are clearly written and each is accompanied by a gorgeous picture of the finished product and some also by step-by-step shots of the most complicated techniques, even if I find that none is really difficult. Most of the recipes contain ingredients that you can easily find at the supermarket, so that you don't have to get mad searching the exotic markets, even if they all draw inspiration from different kinds of cuisines. What I liked most and found very helpful is the Think Ahead section at the end of each recipe. It contains everything you need to know to make things ahead and assemble them at the last minute, so that you can enjoy yourself together with your guests: how far head you can assemble your creation, how to freeze it, how long you can marinate it, how long it will keep in the fridge and how to reheat it and so on. I really love this book. It is great for entertaining, even if you must have the time to prepare the most complicated recipes. None of them is really difficult, but some are time consuming. Anyway, this is a must for the appetizer crazy! I was looking for a book that would give me some new ideas for my cocktail party.This book came through with flying colors -- lots of unique recipes ranging from simple (spiced pecans and roasted red pepper feta dip) to difficult (homemade tarts).This book has some great menu recommendations that suggest items based on criteria like "make ahead" or "informal" or "impressive".This book has been well worth the money spent on it. Betty Crocker cake mixes have been flying off the shelves since the reformulated product and its new packaging hit the stores in 2003. 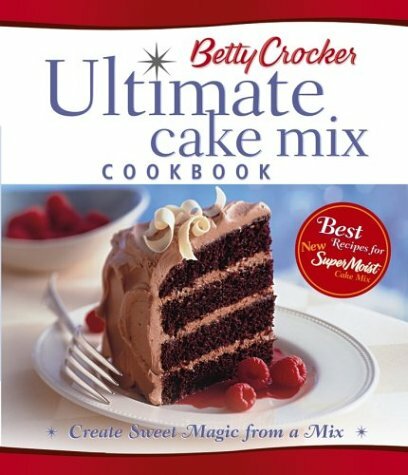 Now, Betty Crocker Ultimate Cake Mix Cookbook has been expertly updated to work using the new mixes, with recipes skillfully amended to ensure the best results every time. The book's title tells us all we need to know. this is for the expert cake decorator. Nevertheless the details and instructions within can help all decorators achieve higher standards. many of the tips are very useful as well as giving guidance on what to avoid. the step by step instructions are easy to follow and the cake designs are tasteful and low key, the emphasis being on attention to detail. I searched high and low for the perfect Tapas book for my wife. She loves this one. Beautiful pictures, great recipes and not too many really-hard-to-find ingredients. Give this one a try. I only gave it four stars instead of five because not every recipe in the book has a corresponding photo. Sometimes you have to use your imagination. 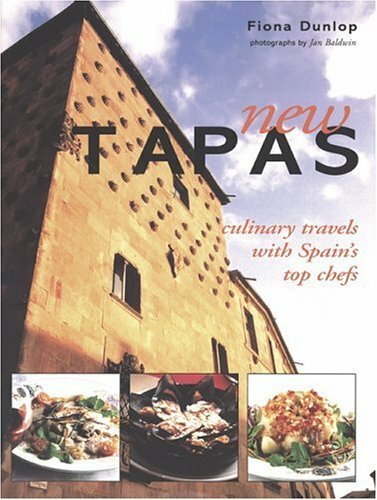 The back of the books contains a regional list of recommended tapas bars, a glossary of terms and a recipe index by ingredient. Tapas are fun, tasty and delicious! 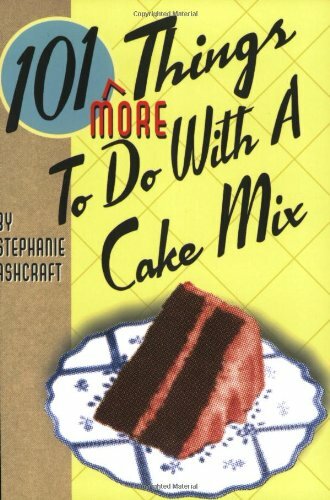 What could possibly top the New York Times best-selling cookbook 101 Things to Do With a Cake Mix by Stephanie Ashcraft? Why, more delicious cake mix recipes of course! Coming this spring, it's 101 More Things to Do with a Cake Mix! Stephanie Ashcraft has done it again, serving up more lovin' for every busy dessert-lover's oven. 101 More Things to Do with A Cake Mix includes simple and delicious recipes-allusing cake mix as a main ingredient-for sweet rolls, breads, cookies, cakes, trifles, ice cream sandwiches and cakes, dessert pizzas, and much more. With a delightful variety of recipes to choose from, there's a sweet treat for every occasion. Don't miss out on what will surely be another New York Times best-seller! Preheat oven to 350 degrees. Mix cake mix, egg, and butter together. Mix in flour. Spread dough thinly to cover a jelly roll pan or cookie sheet. Bake 10-14 minutes or until a light golden brown. Allow to cool completely. Mix powdered sugar, cream cheese and whipped topping together. Spread over cookie layer. Top evenly with fruit and nuts. Drizzle caramel ice cream topping over top, if desired. Store in refrigerator. Okay, we know you only read The Chocolate Biblefor the articles, but will your friends believe you?After all, thisstunning book is so overflowing with luscious photographs of chocolatein all its delectable varieties, shapes, and forms that it's hard tobelieve one could get any reading done under the circumstances.Still, if you can tear your eyes away from the illustrations, the textin this beautiful reference work is well worth perusing. 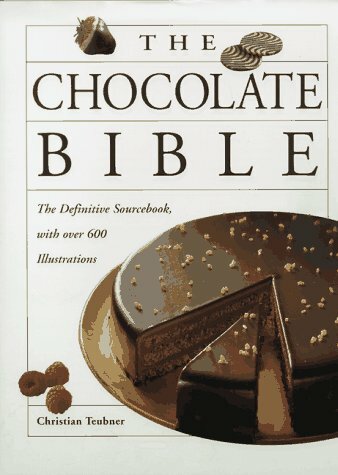 From thehistory of chocolate in the first chapter to the recipes featuring asavory rather than sweet version of the bean in the last, TheChocolate Bible lives up to its name as the definitiveresource. An excellent book. Covers: history of chocolate, cocoa harvesting and varieties, chocolate manufacturing, tempering, making chocolate designs, chocolate decorations, cake making, chocolate fillings and coverings. Recipes include tortes, small pastries (like petit 4's and cookies), a big candy section. Also individual desserts like charlottes, mousses, souffles, and icecreams, as well as chocolate drinks. Lists equipment manfacturers in the back. The book is beautiful and would be great for the coffee table even if you didn't use the recipes. I haven't tried any of the recipes yet, but they look sound from my experience. I feel it's different enough from other chocolate books to warrant buying. Compared to its peers that I own (Cocolat, the International chocolate cookbook, and Death by Chocolate) I would say this book excells in the presentation category for sure. It gives info on chocolate history that some of the other books don't. There are a LOT of recipes in this book. I would not recommend this book (or any of the other chocolate books I own, actually except for maybe Cocolat) for the absolute beginner unless he or she has another complementary book about cakes or pastries. The reason is while a lot of techniques are shown here, not a lot of "this is what can go wrong, and why" statements are included. So, if you goof, you might not know why. It doesn't go into which chocolate brands are the best, or talk about other ingredients (eggs, flour, etc) at all. In other words, the strengths of this book are presentation, showing techniques, history, recipe variety, but not recipe understanding. Probably my 2nd favorite chocolate book that I own (behind Cocolat). 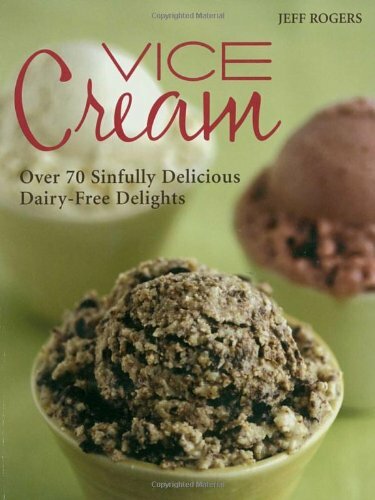 This book won the 1998 IACP award in the baking category. If you love chocolate yourself, or if you simply know someone who loves chocolate, as I do, this is THE definitive work! It begins with a fascinating look at the history of chocolate and then goes on to give us every chocolate recipe imaginable--and some that are not! There are recipes for candies, cakes, cookies, fillings and cocoas, all generously laced with gorgeous photographs that only add to the enjoyment of the book. Of particular interest to me and my family was the recipe for Mexican chocolate sauce, a wonderful combination of chilies and chocolate. 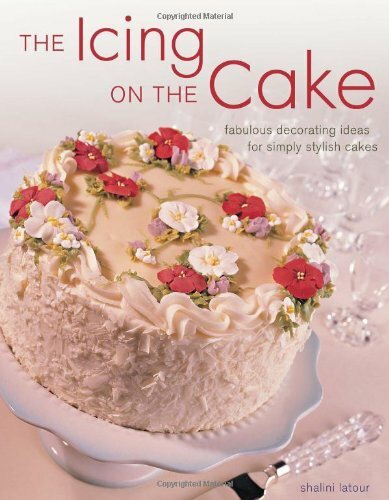 The book also has recipes and tips for decorating with chocolate. I've tried many of the recipes and all have turned out simply delicious. And, if you're looking for a dessert to impress guests, you're sure to find it here! For the chocolate lovers of the world, this book certainly has it all. Glucose: Not so hard to find. I just purchased this book. I find it excellent. Although I am a professional chef I think this book is very user friendly for the home cook. An earlier reviewer said they couldn't find glucose syrup. You can buy it in most super markets they just call it corn syrup. Use the white variety if available. It's also good for making sponge toffee. I just finished tearing out the pages of this worthless book and sending them to recycling, while throwing the binder into the trash compactor with the dreadful chocolate pecan pie it spawned. Never have I seen such a degradation of Valrohna chocolate, Normandy butter, free range eggs and a great deal of time. What a dreadful, dry, disgustging mess this recipie is! Do not waste your time on it. To make the nut ice cream even healthier use raw organic nuts. Yes they are high in fat but when they are used raw, it is good fat. Roasting the nuts causes the oils to become rancid and acidic. When it comes to wedding cakes, everyone wants roses. In this fabulous new book, the art of floral sugarcraft is revealed by authors with experience in these unique techniques, showing readers virtually every kind of rose decoration that can be applied to a cake, as well as sugar roses in bouquets, sprays, posies, and for table arrangements. Sugar Roses for Cakes includes templates and features collections of all different kinds of roses: wild, climber, rambling, traditional varieties and the various modern roses, from full blown modern blooms to delicate, five-petal wild roses. With nearly 200 full-color photographs, this books offers a wide array of designs and cakes, including cakes for occasions other than weddings. 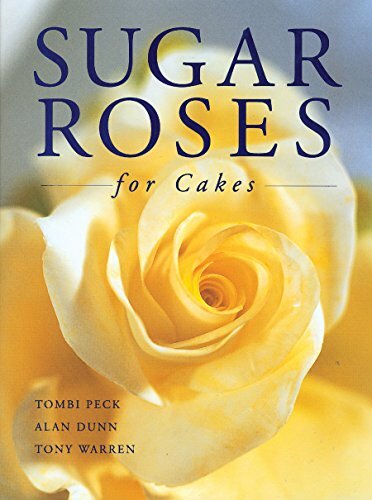 The perfect book for brides and wedding planners, Sugar Roses for Cakes picks up on the latest trends in flower arranging to reveal many innovative ways to display sugar roses. My prior review was for Sugar Roses -- not this one! I wrote a review for Sugar Roses (a book I said is OUTSTANDING) and they've put that review onto this book as well (Sugar Flowers for All Seasons). I've noticed they duplicated the reviews from others too. I have not looked Sugar Flowers for All Seasons so I can't say one way or the other if it's any good, (although considering the author, it's probably great). It was nice to see a book with more than just roses and by more than one artist. There are some neat ideas with good instructions. I have only been making sugar flowers for about 7 years and was glad to see a few new ideas. This book is not only EXQUISITE to look at, but very detailed in its instruction. Since it is mainly roses, you get more varieties, which I find a tremendous bonus, since most cakes only display your basic white, red or pink rose. The book is separated into luxurious flower arrangements (that highlight a certain variety of rose) and the following pages tell you in detail how to create that rose, the other plants in the arrangement, and to assemble. All of the pages, including the ones of directions, are in lush full color photographs, and laid out as beautifully as the incomparable flower arrangements. Worth EVERY penny. 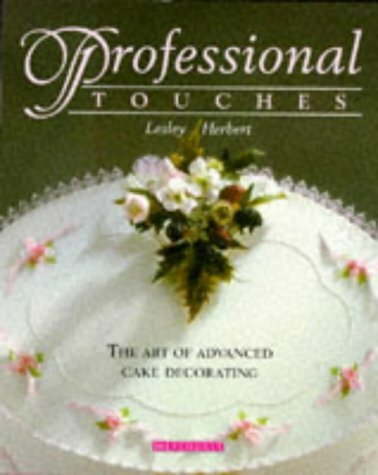 This books has a very detailed guidelines to the art of making sugar flowers. One can follow very well, as each step is very clearly mentioned . I would suggest it is one the best books purchased & can be treasured. I love cupcakes! They are easy to make, easy to dress up and lovely to eat! I didn't know what to expect from this book, since I saw contrasting opinions, but now that I have tried some recipes I can say I'm glad I bought it. Well, some of the recipes take several hours, maybe days, to complete (for example: butterfly cupcakes and cupcake flower vase), but there are also others that are easy and yet stunning, like the Cabernet Chocolate Cupcakes and the Winter Spice Cupcakes. I like the fact that recipes for chocolate modelling clay, fondant and royal icing are included and I also like the "cake to cupcake" conversion chart. If you are looking for easy, uncomplicated recipes, I suggest you try "Cupcakes" by Ceri Hadda: I found a load of interesting and yummy recipes and none is too complicated. Of course, this Artful Cupcake is "another planet", but, like any work of art, many of these project require a lot of time. 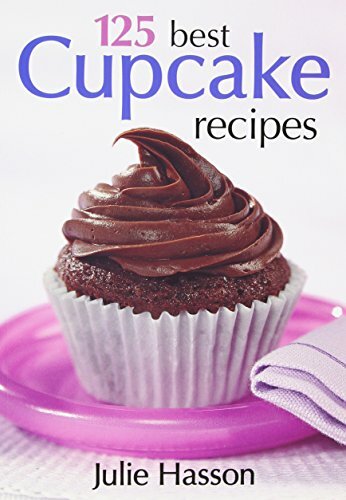 I was delighted to find this book since, a few weeks ago, I looked through all my many books on baking for a simple cupcake recipe and I could find but one true cupcake recipe. And this was with a cake recipe on which I was not keen. I was doubly surprised to find not a single decent cupcake recipe at the Food Network web side at the time. Upon reading this book, the first thing which struck me was that it was as much or more a craft book than it was a book on baking. The first clue is that the publisher specializes in craft books. It is not one of those major cookbook houses like Knopf, Clarkson Potter, Wiley, or even Ten Speed Press. The next clue is that the author's previous books are all on craft topics such as decorating with lights, gel candles, silk flowers, and scarecrows. The story becomes clearer when it is evident that the name on the front cover, Ms. Marcianne Miller, is probably much more a collector and editor of ideas than an author, let alone a baker. Among the fourteen (14) 'Contributing Designers' names at the end of the book, her name appears last. A minority of the thirteen other individuals named and profiled here are professional bakers. Most are amateurs whose main vocation is in the arts, crafts, or non-baking part of the food service industry. All this is to make the impression on you, dear reader, that this book is less about baking cupcakes than it is about baking AND DECORATING cupcakes. This is not to say this is a poor book. Just the opposite is true. 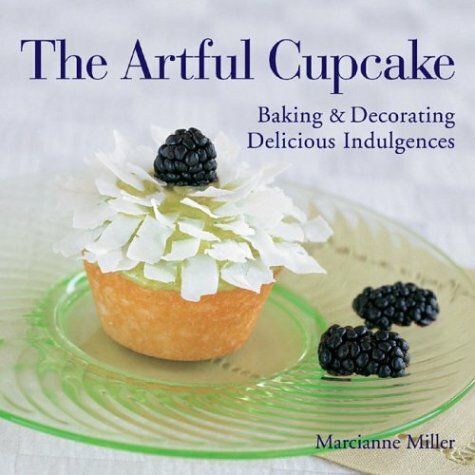 This is a very good little book on baking AND DECORATING cupcakes. The book begins, as expected, with basic baking. On this matter, the book is brief, but flawless in giving you the essentials of cupcake baking. As part of this introduction, it describes silicone muffin pans and mini-bundt pans, neither of which have I taken much notice until I saw them here. The section on basics includes an extremely useful instruction on how to convert all but sponge cake recipes into a cupcake recipe, based on the size of cake pan for which the recipe is scaled. The introduction continues with basic instructions on frosting and icing and how to use piping bags and other decorating equipment. The most important information in the intro is the three basic cupcake recipes for Classic White, Easy Yellow, and Chocolate Buttermilk cupcakes. This is followed by three basic recipes for classic buttercream, ivory buttercream, and cream cheese frostings. Each of the remaining thirty-six main sections are a pairing of a cake recipe with a topping or decorating technique. Most of the cake recipes are familiar, but some such as the key lime tarts and the chocolate truffle cupcakes are quite a pleasant surprise. Not every section introduces a new cake, but every section does introduce a new decorating style, technique, or topping. Some of the toppings are borrowed from well-known standards such as a Maple Walnut Streusel and white chocolate roses. Many other toppings are elaborate. Some are elaborate in the extreme such as the chocolate domes which are worthy of a major pastry talent such as Jaques Torres or Pierre Herme. The cupcake styling chapters are interspersed with sidebar sections on special techniques and ingredients such as baking with nuts, baking with fruit, fruit glazes, baking with spices, small decorative touches, and decorative sugars. I found no deep insights, or even any new facts in these sidebars, but they were often assuring me that my experience was not taking me off in the wrong direction. If, like me, your primary interest is in baking and not in crafting, you will probably get your money's worth from the cake, frosting, and icing recipes. If you are primarily a craft person, you will get the straight scoop on the baking and lots of ideas for show-off decorations. 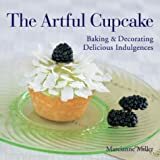 As a sturdy hard cover book for less than twenty dollars list, this book is a worthy addition to your library, as long as you have the need to make cupcakes, especially for kids, at least three or four times a year. The only thing the authors overlooked was to provide at least one cupcake suggestion for each major holiday where a cupcake might be an appropriate dessert such as New Years Eve, Valentine's Day, Easter, Mother's Day, Halloween, Christmas, and a child's birthday. I guess you will have to rely on Martha Stewart for this. Highly recommended if you have the time and inclination to do fancy cupcakes. Wow, What a marvelous little book!!! With these recipes at hand, any "amateur" pastry chef can wow a crowd. Well I hope professionals are not looking for recipe ideas here!!! Expecially at $13.00. It gives equipment needed, directions,awesome pictures, and a wealth of advise. Napkin Wrapped Cupcakes on page 43 was a hit at our law office. PS. They go great with a cappuccino!!! I was hoping for something with more sophisticated looks than this book provided. Perhaps for someone not really familiar with baking, the ideas would be useful. For serious pastry/cake/cookie decorating people, this might be a bit too simple. Williams-Sonoma, purveyor of choice gourmet products and kitchenware, has also created a collection of succinct yet comprehensive cookbooks. Part of the series, Soup offers 40 all-occasion recipes that reflect the company's signature good taste. Well-chosen formulas for what is surely the world's most satisfying food include classics like Chicken Noodle Soup, Shrimp Bisque, and French Onion Soup; simple soups like Garlic Stracciatella; and dinner-party specialties such as Three-Mushroom Soup with Sherry. Recipes for summer and winter soups like Curried Corn Soup and White Bean, Pasta and Swiss Chard Soup take advantage of seasonal bounty, while a concluding section entirely devoted to chicken soups such as Tortilla Soup with Chicken and Avocado gives readers more of soup in its most comforting form. I think that this is a great soup book. All of the soups are very accessible in the variety of ingredients that they require and the 5-8 soups that I've made have been supurb. There is a soup for every occasion, and several for every season. If you enjoy soup, like to have easy recipes on hand as well as a few that make you feel a little like a real chef, this is the book for you. One of the three recipe books that I look at on a regular basis. Not a bad recipe in the bunch! I was given this book as a gift 2 years ago and I can't say enough good things about it. I was a little shy of soup making at the time, but have been so amazed that every single recipe I've made from this book has been fantastic. I attribute that to well-written recipes, they really are fool proof. I think you'll be happier with this book if you own a hand blender, as nearly every recipe calls for some pureeing, and it is SO much easier with a hand blender. The book isn't as big as some of their other cook books... about half the size. However, the recipes look great. I plan on trying several in the near future. The best part of the book is the pictures... they tend to inspire you to cook. This book warms the soul! 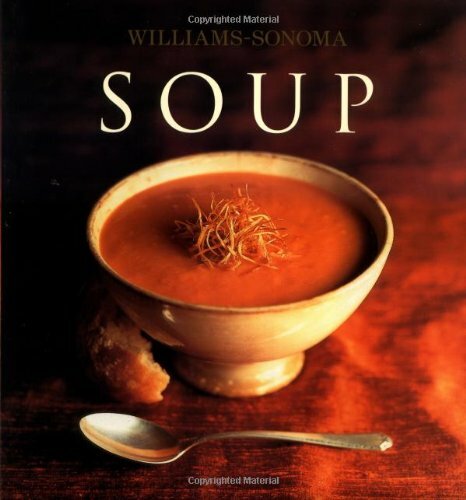 Williams-Sonoma continues to impress me with its newest series of cookbooks, and SOUP is no exception. The recipes are easy to follow, and very specific to help ensure delicious results! I am able to create wonderful soups that look like the pictures, and taste even better! I highly recommend this book for all soup lovers! Scrumptious delights to bake at home. Cupcake bakeries are a welcome development that is meeting the enthusiastic delight of everyone. The reason is quite simple -- they allow us to indulge in an old-fashioned favorite treat. Julie Hasson, baker extraordinaire, brings her expertise to the 125 Best Cupcake Recipes. These are the cupcakes of our mothers and grandmothers, but with a modern twist. Easy-to-execute, these recipes are guaranteed to fill your home with tantalizing baking smells and sweet satisfaction. Recipes include:- Raspberry Vanilla Cupcakes- Carrot Zucchini Cupcakes- Flourless Chocolate Cupcakes- Malted Espresso Cakes with Malted Milk Icing- Peanut Butter Cupcakes. Delicious and comforting, scones, muffins, tea cakes, and biscuits make classy accompaniments at brunches, teas, luncheons and suppers. They also stand on their own at breakfast snack time.Scones, Muffins & Tea Cakes: Breakfast Breads and Teatime Spreads is an invitingly designed, photographed and priced collection of more than 54 recipes for quick breads and spreads. Many of the recipes and photographs have been chosen from the acclaimed Country Garden Cookbook series, the recipient of prestigious awards for food photography by Deborah Jones and Kathryn Kleinman. Also included; are newly developed recipes that take advantage~ of modern baking equipment such as mini-muffin and tops-only baking pans. Heidi haughy Cusick, the editor of Picnics, has selected a tantalizing assortment of recipes such as Banana and Butternut Squash Bread, Lemon Scones, and Spicy Green Onion Corn Muffins. 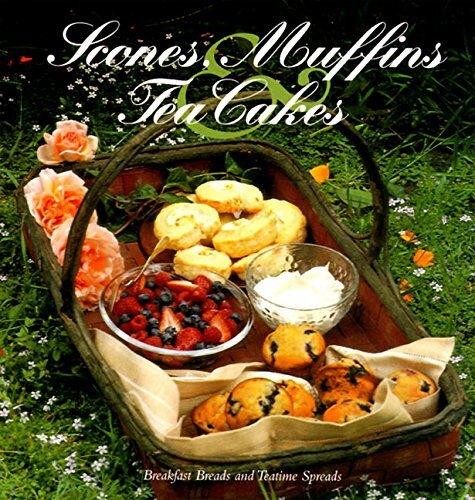 Scones, Muffins & Tea Cakes also features entertaining tips and original occasion menus, such as "Sunday Morning on the Veranda" and "A Victorian Christmas Tea," plus over 18 recipes for sweet and savory spreads including Lemon Curd, Cranberry and Nectarine jam, Herb Flower Butter, and traditional Clotted Cream. This definitive assemblage of recipes is lavishly photographed and illustrated to offer cooks not only luscious baking inspiration, but also dozens of versatile serving ideas as well. This book is fabulous! I've made most of the scone recipes and am starting to work my way through the muffins and tea cakes. I usually bring the results in to work, and everyone (Australians and Americans, both) loves the dishes from this cookbook. In addition, the recipes are straight forward, nicely illustrated, and easily lend themselves to experimentation. Excellent book for anyone who likes to bake quick breads of any type. I have ordered every gifts from the kitchen book I ever heard of, but was usually deeply disappointed.IMHO, only five are worth owning - and this is definitely one of them.Each recipe is preceded by a brief description of why it is special - and all are, indeed, special, often containing secret ingredients, such as pepper in ginger cookies.There are even wonderful slice and bake cookies.The recipes are awesome; don't miss this incredible book. 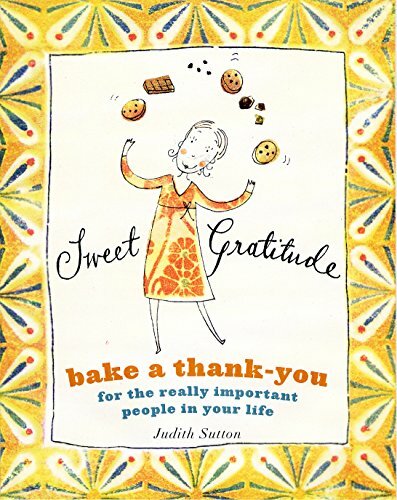 The idea behind this book is to bake for those in your life you want to thank, for small favors or big gestures and everything in between, but the book itself could be a thank you gift. I like how all the recipes can be made ahead of time, and the storing and mailing instructions are really helpful. The recipes? Chocolate, coconut, caramel, ginger and all sorts of other good things! This is an absolutely charming book full of cute illustrations and top-notch recipes. The Super Fudgy Brownies are the best I've ever tried, and I've tried quite a few brownie recipes. I made the Totally Unlike Store-Bought Caramels and was floored by how deliciously chewy they were. The book also includes lots of helpful info on packing and shipping homemade sweets. You have MY gratitude, Judith Sutton!